Multifunction timer with 5 functions and 4 time ranges. The function and the time range are selectable via 2 front mounted rotary switches. The time ranges cover 0.6sec.-60min. or 0.6min.-60hrs. The time is adjustable on the timer front. The timer can directly be connected to the supply voltage in the range of 10.5-265V AC/DC. Single or double relay output with LED indication of energized relay. Intermittent flashing of LED indicating timing period (over 6 sec.). Versions available for DIN rail or 11-pole plug-in mounting. The timing period starts when supply voltage is connected. When the preset time has elapsed, the relay is energized. The relay is de-energized when the supply voltage is disconnected. The timer must be connected to the supply voltage permanently. 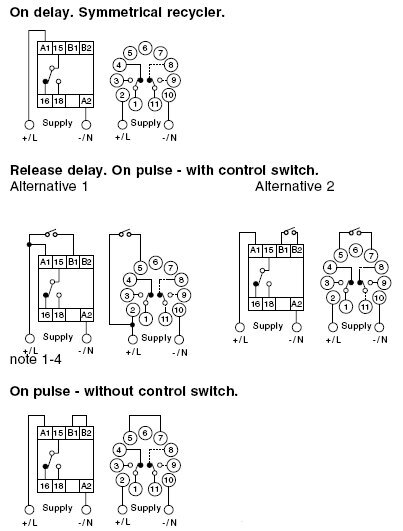 When the switch is closed, the output relay is energized. When the switch is opened again, the timing period starts. The relay de-energizes when the preset time has elapsed. A jumper must be connected between 5 and 7 (B1 and B2). When supply voltage is connected, the relay is energized and the timing period starts. The relay de-energizes when the preset time has elapsed. The timer must be connected to supply voltage permanently. When the control switch is closed, the output relay is energized and the timing period starts. When the preset time has elapsed, the relay de-energizes. To energize the relay again, the control switch must be opened and closed again, after the relay is de-energized. 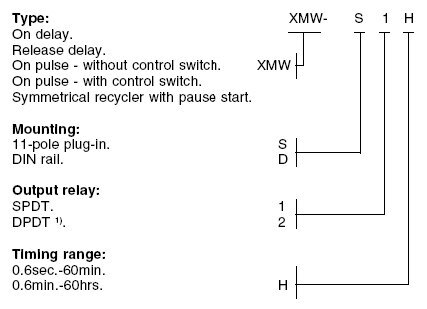 When supply voltage is connected and the pause period has elapsed, the relay energizes. The relay remains energized during the pulse period. The sequence is repeated until the supply voltage is disconnected. The duration of the pause and pulse periods is equal. 0.6-6sec. / 6-60sec. / 0.6-6min. 6-60min. / 0.6-6h. / 6-60h. Double output relay only available in S2 versions.